It is important that we must be ready at all times in case of emergency. We must prepare ourselves before anything worse happens during an accident. Although most of us are aware that one must know the basic procedures and first aid in case of an emergency, some of us could not care less or do not have the knowledge on what to do during an emergency. 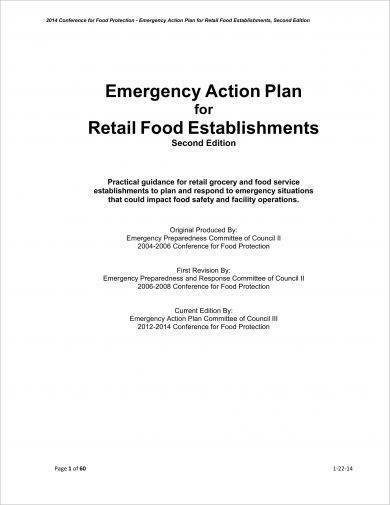 Hence, it is vital that every entity and building establishments, including homes, stores, and offices, must have an action plan that specifies the evacuation plans and other procedures needed to be taken in case of emergency. 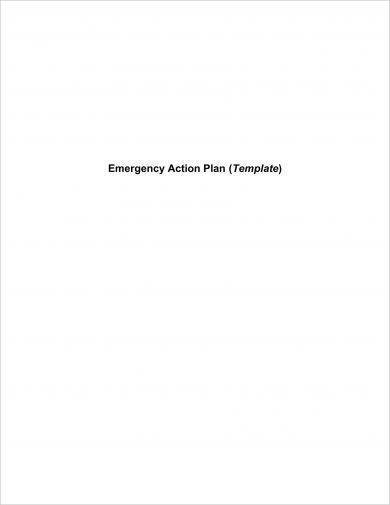 Provided below are the different examples of emergency action plan that might help you whenever you are planning to create one. In your action plan, it must contain the important information necessary for the reader and users to understand its content, be easily comprehensible, and be concise and brief. Below are the elements that comprise an emergency action plan. 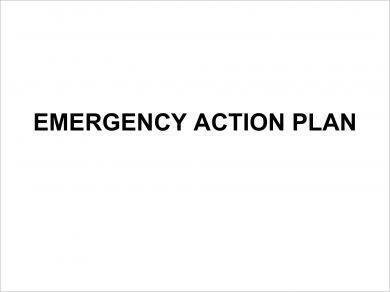 An emergency action plan must state the emergency evacuation plans in case of an emergency. It must include the escape procedures as well as escape route assignments. There is no generic plan for escape routes since every establishment had different building layouts and roofing location. Normally, a building is constructed with an escape route already being considered in the first place. The tenants must be informed and be well are of the emergency exits. 2. Procedures to be followed by employees. During an emergency, it is normal for people to get frantic and would not know the right thing to do. Everyone would be so occupied to save their lives at that time. However, they must follow certain procedures, for example, falling in line, covering their heads, without rushing when they will go out from the building. You may also see work action plan examples. In cases where employees are involved in works that deal with tanks of certain chemicals or gases, they also have specific procedure needed to be taken like closing and shutting down the tasks before evacuating the area. Again, every establishment needs to be addressed specifically and uniquely, different from each other. You may also like career action plan examples. 3. Procedures to be taken after the emergency evacuation has been completed. 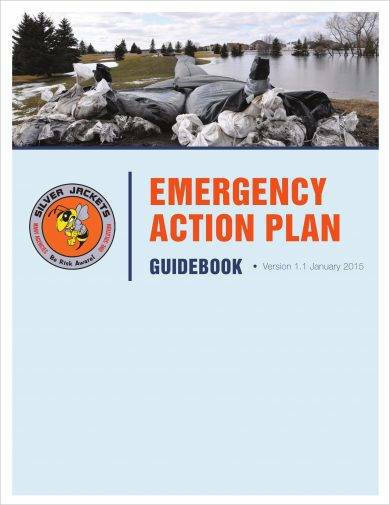 The simple action plan must contain not only the action to be taken before the emergency and during the evacuation process but also the action to be taken after the evacuation has been completed. It must state how the company heads will take account for all the employees, the location of accounting, and the manner of accounting all the employees. Again, this will vary from establishment to establishment since every entity differs from the number of employees and the location where they can account their employees. 4. Rescue and medical duties for those who are to perform them. There are entities where they assigned rescue and medical duties to some of their trusted personnel or employees. These people might have attended a seminar on medical duties such as first aid procedures so they are perfect to do such task. 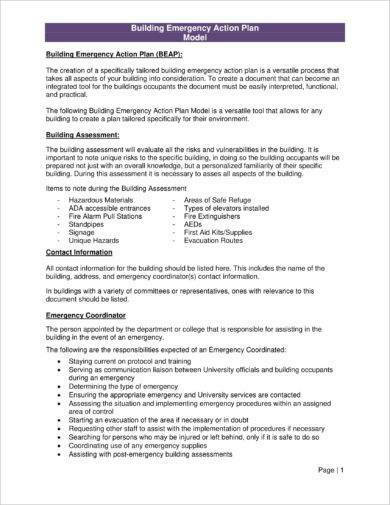 In this case, this must be written in the action plan and be indicated in one section so that other employees will know whom to run to with regards their need of help. On the other hand, if an entity has decided to rely on the service of outside medical service, it must as well be indicated in the general action plan. 5. The means of reporting fires, medical, and other emergencies. 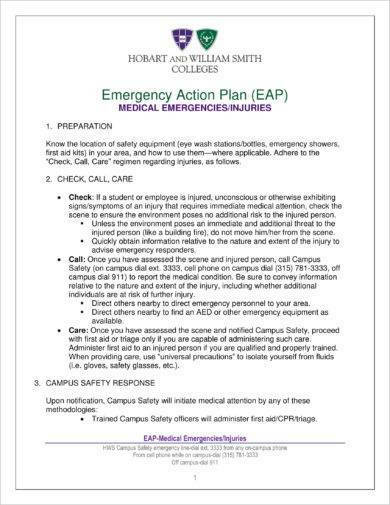 The method of reporting the emergency, for example through an air horn or siren, that will be used to inform and alert the employees to evacuate must also be specified in the action plan. For large entities, an air horn may be needed, but for entities with few employees, a human voice may suffice. You may also see sales action plan examples. 6. Person who can be contacted for further explanation of duties. The names or titles of people or departments who can be contacted for further information or explanation of duties must also be stated in the action plan. The contact information may be an email address, a mobile or telephone number, or any modes of communication provided that it is working and the person can attend to immediately. You may also like business action plan examples. The alarm system must be loud enough above surrounding noise conditions for it to be understood as an alarm. The alarm should also be distinctive enough to result in evacuation. The equipment used as an alarm must be periodically tested for reliability. 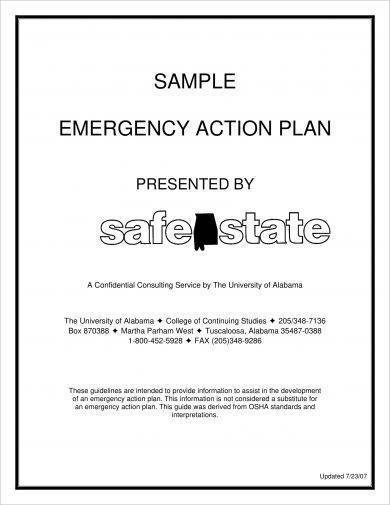 You may also see emergency management plan examples. 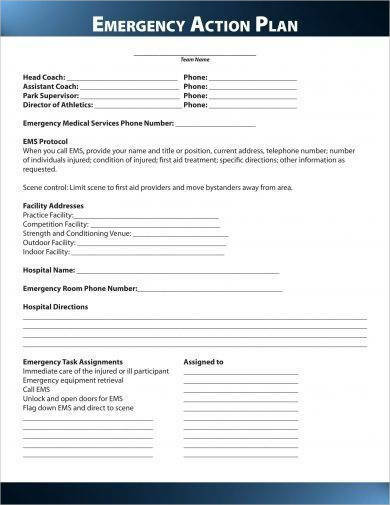 You may also like emergency information form examples. 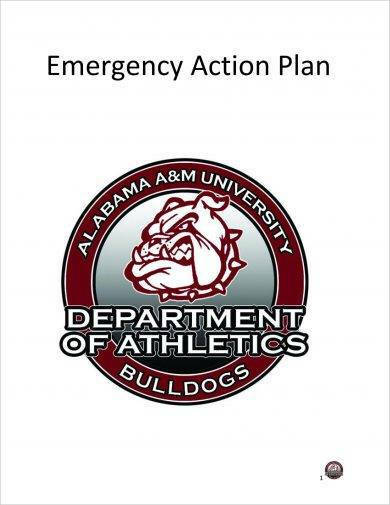 Creating an effective emergency plan is developing a system to communicate before, during, and after an emergency and assigning responsibility to ensure certain tasks get completed when emergencies happen. You must have internal and external communication as well as internal and external response. The first thing that you must think of with regards your plan is about your operation. You must decide how you would communicate to your staff the moment that you evacuate. On the other hand, you must also provide a way of communication so that the workers can communicate with you in case of injuries that might happen due to the emergency or accident. There is an endless possibility in the form of communication that can be opened for both the parties working during the emergency. You may also check out employee action plan examples. The key is to use a consistent system, everyone must be well aware of it. Furthermore, emergency evacuation posters must also be disseminated showing the means of egress and meeting spots. Since most emergency situations require some kind of outside assistance, ensuring that the call for help can be made quickly in case of an emergency and that the person making the call is legit and has all of the pertinent information to get the rescue workers and volunteers to the scene as soon as possible. Furthermore, it must be ensured that you have a system that can alert the neighbors in case the emergency involves them. You might be interested in marketing action plan examples. You may also see corrective action plan examples. To get a positive response from outside rescuers and volunteers is to have a have a great working relationship with them prior to your needing them during the emergency. Meetings, tours within the building, and on-site drills will allow them to get a grasp of your operation without the chaos in case in a real emergency situation. You must remember that when they show up on site during an emergency, they are now in charge of their specific tasks, and you need not worry anymore. You may also like SMART action plan examples. It is important that tenants and employees must know what to do and where to go during an emergency situation. You and the outside volunteers must conduct a training and orientation program to help them be accustomed of the procedures in case of emergency. You may also check out research action plan examples. \In this way, they will know the alarm and notification systems, evacuation routes, as well as the meeting spots. Moreover, they will be less frantic during the actual emergency because they have been trained on what to do. Drills are important as well as this will help the people practice what they must do in actual emergency situations. They can practice where to go, and they will know whom to approach for first aid and medical emergencies. Drills also provide essential feedback on how in-tune the employees are with the simple action plan. The results of the drill will determine if your company would require retraining or redrilling to ensure that the plan works well. The process on developing an action plan may be hard to figure out. You must list all the tasks needed to be achieved for the goals and missions to be reached. It focuses on what needs to be done in order to reach the better goal, the person involved to help reach the goals, and the roles of other employees within the company. To help you get through in creating an action plan, here are some tips that might help you. 1. Set an objective. This must address specific goals, who will work on certain goals, and the timeline for each goal. 21. Make reasonable objectives. This will keep the action plan in a realistic view point. 3. Go over how the tasks relate to the goals. 4. Create a list of all the objectives that need to be accomplished in order to reach the goals that have been set. 5. The different departments involved should have their own separate action plan for every department has a role to be played distinct from the other departments. You may also see team action plan examples. 6. In the different departments, you must make sure that managers and employees have their specified action plans as well, detailed enough for each one to fully understand his or her role. This will also help other people be aware of what their roles are within the action plan. You may also like project action plan examples. 7. Set timelines and deadline for each task in the action plan. The deadline will help the different contributors know what to prioritize first. This will also keep them focused on their priorities and beware of the designated schedules. You may also check out budget action plan examples. 8. You must also make sure to verify and monitor if the tasks of the action plan are being implemented. Planning is never good without implementation. 9. Acquire and listen the feedback from the people who are involved in the action plan. You can ask them to leave a comment on how to do better with regards the action plan. 10. Reward every employee and department when the tasks on the plan have been successfully completed. This will keep them motivated and continue to work with you knowing that their efforts are not in vain and are very much appreciated. You might be interested in how to make an action plan. 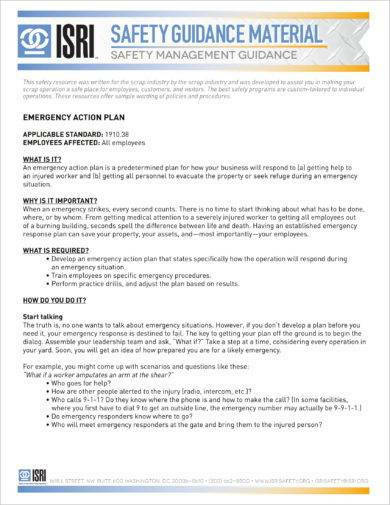 Lastly, before an emergency situation happens, it is better that you are already prepared for the circumstances and better yet, create your emergency action plan with the help of the discussion and comprehensive examples above.